But that’s not a bad thing. In fact, the good news is, we’ve been awarded a grant to undertake this project (yay!). Better news is that you have the chance to get involved. So, have a read of our news if you’d like a bit more detail, or scroll down to find out how you can work with us to make a change. In case you weren’t already aware, Pactster is a startup company. We’re a small team and, so far, we have been completely self-funded. Despite being a pretty resourceful bunch, we don’t exactly have piles of cash lying around to do all of the amazing things that we dream of. So, occasionally, we will apply for grants to undertake a project. As we’re sure you can imagine, we’re thrilled to announce that we have been awarded a £75K grant to undertake a new project to improve Pactster for people with cystic fibrosis. We were awarded this as part of the Innovate UK Digital Health Technology Catalyst (bit of a mouthful! ), which is funding that UK businesses can apply for to “speed up the development of new digital technology healthcare solutions” - like ours! This funding is dedicated to running a 12-month project to help make it easier for people with cystic fibrosis to increase the amount of exercise that they are doing, since we know all about the huge benefits of exercise to people with cystic fibrosis. As part of this project, we’re working with behaviour change experts (very smart people with a deep understanding of health and exercise psychology and behaviour change science) to develop some new features that we hope will help more of you to exercise more often. But even though these guys are super-smart (we’ll introduce you to them soon so you can see for yourselves! ), the people that we really want to hear from is you! 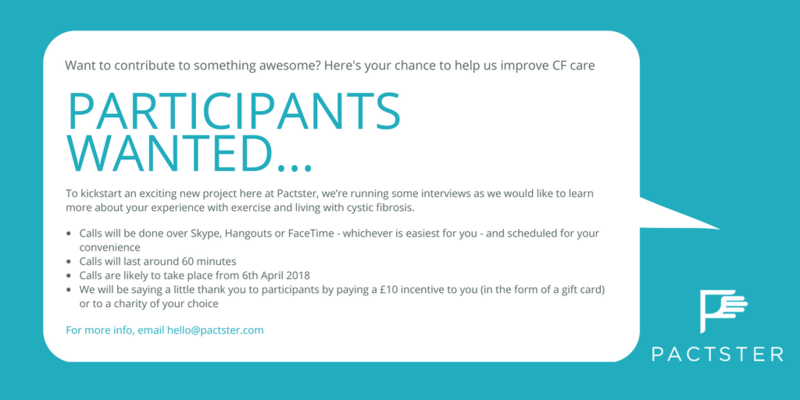 To kickstart our project, we’re running some interviews as we would like to learn more about your experience with exercise and living with cystic fibrosis. We will be saying a little thank you to participants by paying a £10 incentive to you (in the form of a gift card) or to a charity of your choice. If you’re interested, we’d love if you could answer a few quick questions to help us book you in for a chat. Simply click here to do this by Sunday 8th April and someone from our team will be in touch with you as soon as possible after you hit ‘submit’. Whether you’ve signed up and worked out with us or have never heard of us before today, we want to hear from you. Even if you signed up but are no longer using Pactster on a regular basis (in fact, especially if this is you! ), we want to hear from you. As always, if you have any questions, just drop us an email at hello@pactster.com or contact us via social media. And, if you know someone else with CF who may be interested in helping us make positive changes, be sure to send this opportunity their way, too. We can’t wait to chat!